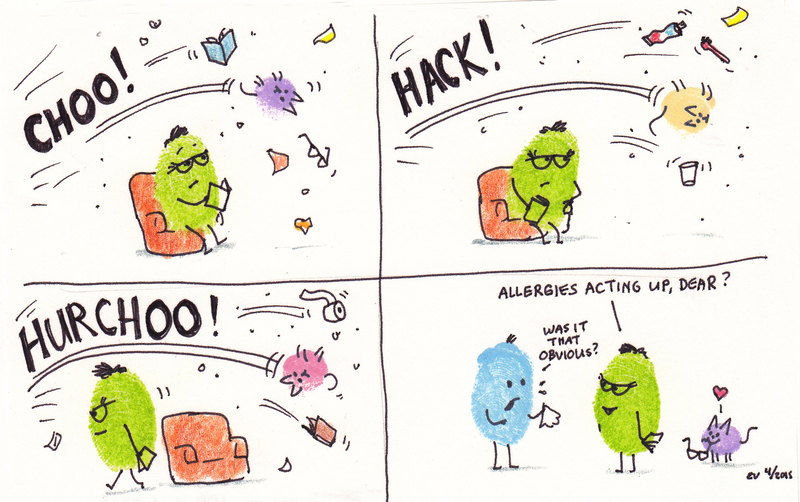 Fingerprint Follies: Allergy Season! – The Pet Shelter,Inc. In extreme cases, pollen can cause anaphylactic shock, causing swelling of the respiratory ways. This condition can be fatal if the cat doesn’t receive an epinephrine injection immediately. Your vet can run tests to establish your cat’s allergies. A simple blood test can reveal the presence of certain antibodies secreted as a reaction to various pollens. Even though today’s technology allows the detection of nearly all allergens, there may be a few rare pollens that cannot be detected. Allergies are not fully treatable, but can be managed. If your pet displays symptoms only during certain months during the year, you can manage the symptoms through administering antihistamines. The antihistamines are meant to inhibit the immune system and stop the production of histamines, so that the allergy symptoms will go away. If you administer the antihistamines for more than 3 months, make sure you see your vet about rotating medicines, as it is possible that the cat will develop immunity to the drugs. Another treatment option and possible solution for the skin rashes and swelling is steroids. However, steroids can have side effects such as kidney damage, which make this type of treatment less popular. Allergy injections are immunization shots that will help the cat be less sensitive to pollens. The injections are an option only if the culprit pollens are detected, because the injection will contain the substances in the pollens to which the cat is allergic. Next Article Success Stories: Fizzgig!